We first conduct a study using abstracted video content to measure the effects of latency on video scrubbing performance and find that even very small amounts of latency can significantly degrade navigation performance. 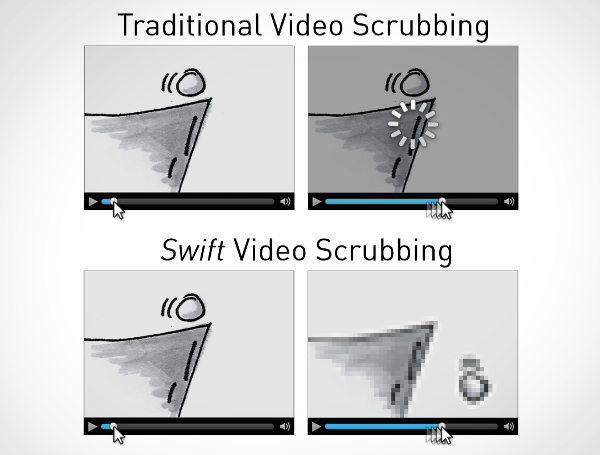 Based on these results, we present Swift, a technique that supports real-time scrubbing of online videos by overlaying a small, low resolution copy of the video during video scrubbing, and snapping back to the high resolution video when the scrubbing is completed or paused. A second study compares the Swift technique to traditional online video players on a collection of realistic live motion videos and content-specific search tasks which finds the Swift technique reducing completion times by as much as 72% even with a relatively low latency of 500ms. Lastly, we demonstrate that the Swift technique can be easily implemented using modern HTML5 web standards.